Fix "iPhone Won't Connect to iTunes"
Why You Need to Tune Up iTunes? iTunes is very resource intensive. The longer it runs, the more junk it creates and this just keeps increasing the space it occupies on your hard drive. That’s just for iTunes though. iTunes also uses a lot of components like Bonjour, that steadily grow in size the more you use them. If you don’t do something about all this space that is gradually going, you’ll soon begin to encounter problems with your iTunes. Your PC may begin to lag and iTunes loads slowly. The application may also begin to experience crashes due to your congested registry. This will seriously interfere with the use and enjoyment of your computer. 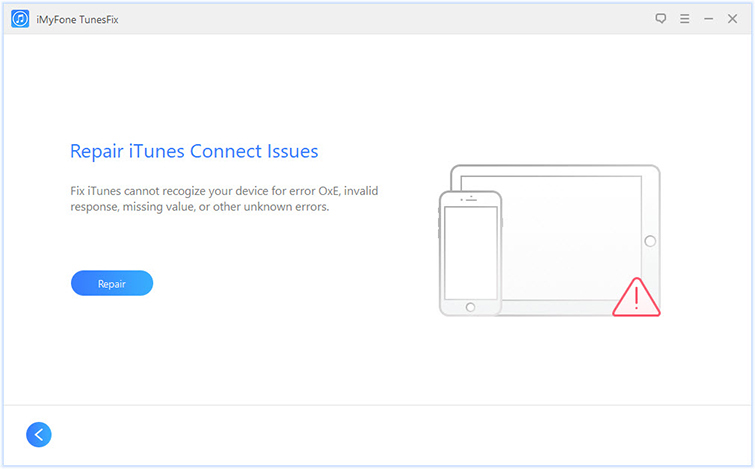 iTunes will also begin to throw up errors like error 21, iTunes update and restore issues, error 53, error 4005, “iTunes was not correctly installed” error 7, Missing iTunes msi. File and a host of other errors. All of these means you need to tune up iTunes on a regular basis. iTunes Runs Abnormally? Try This! iMyFone TunesFix is a market leading iTunes repairer and cleaner. It provides unique ways to get rid of all your iTunes tune up problems with easy to use, one-stop solutions. 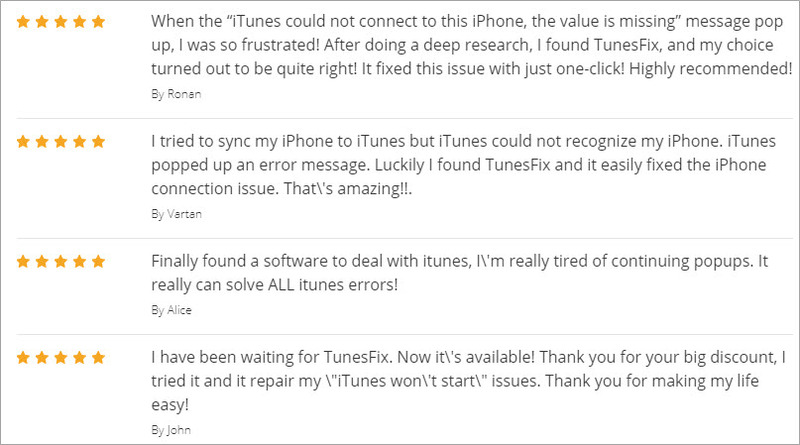 You don’t need to worry over your iTunes throwing up problems or unknown errors when you have TunesFix. Having provided solution to over 100 iTunes errors, TunesFix will give you a way out every time, for both known and unknown errors. iTunes runs slow? Get TunesFix to clear a great amount of junk files: cache, cookies, logs, temp downloads, etc. iTunes quits unexpectedly? TunesFix clears corrupted files/crash logs and fix iTunes components. iTunes shows an error? Let it auto-detect your iTunes and install the repair driver for your iTunes. iTunes runs wrong? Completely uninstall damaged iTunes and components from previous installation, leaving no harmful traces. Your iTunes data is well-protected when your tune it up. Step 1: Launch TunesFix from your desktop. Once launched, iTunes will automatically detect your iTunes and necessary components. 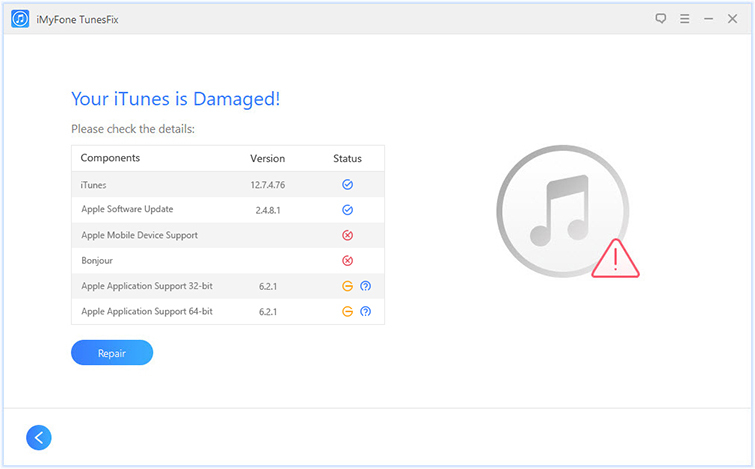 If there’s damage, TunesFix will show you the specific status of your iTunes and allow you choose to repair it. This should solve any error you have. If it doesn’t, proceed to step 2. Step 2: If there’s no damage or after fixing the damage, you will be directed to the homepage. On this page, you can see all the options available to fix your iTunes issues. Step 3: There are four fixing modes here. 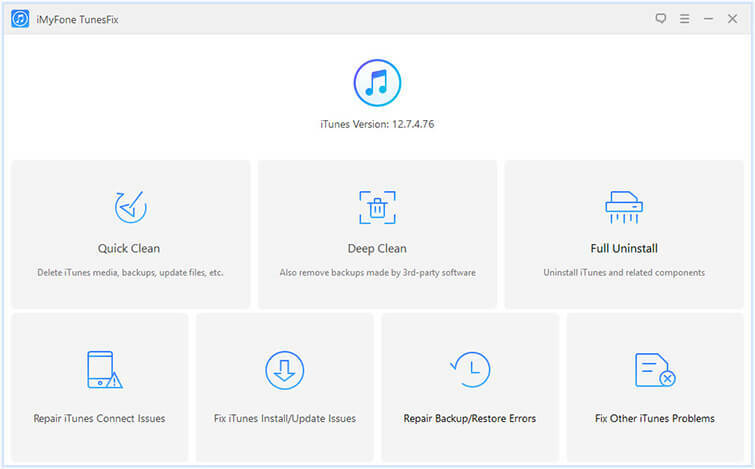 They are Repair iTunes Connect Issues, Fix iTunes Install/Update Issues, Repair Backup/Restore Errors and Fix Other iTunes Problems. Select the repair mode according to the error you encounter and move to step 4. Step 4: Click on “Repair” to start the process. Ensure that your internet connection is stable. Once the repair process is done, your iTunes will work properly. Step 1: Launch TunesFix. Then you’ll be directed to the homepage. Step 2: On the homepage, there are two cleaning modes that you can choose from. 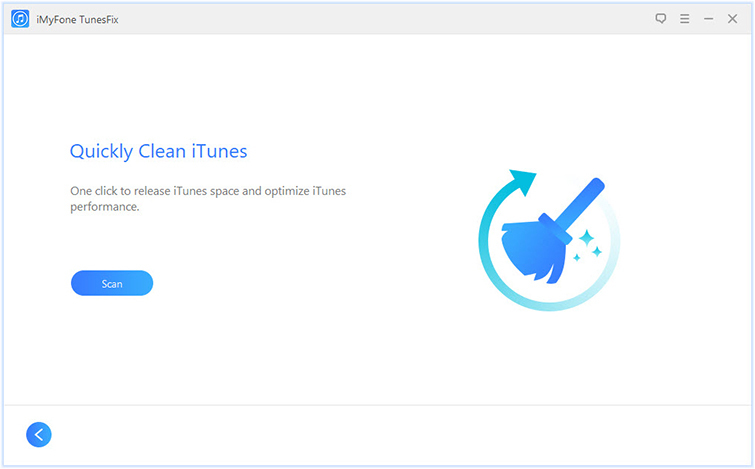 “Quick Clean” allows you clean iTunes media, software update files, iOS backups, cache, cookies, logs and other junk files. “Deep Clean” allows you also remove iOS backups from 3rd-party software. Select the clean mode you need and let it scan. Step 3: Preview and selected useless files. Then click “Clean” to let it start. 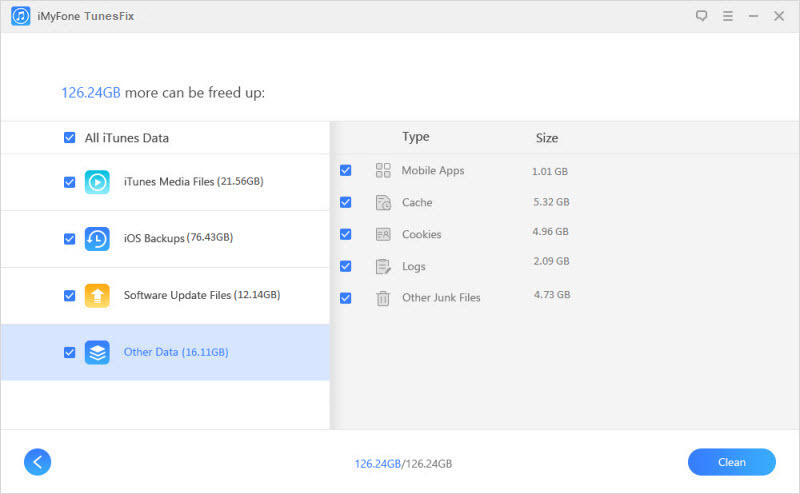 Note: All the useless and junk files are always stored in the “Software Update Files” and “Other Data”. You can also check some unwanted files from “iTunes Media” and “iOS Backups”. Step 1: Launch iMyFone TunesFix. When you are in the home interface, choose “Full Uninstall” feature. 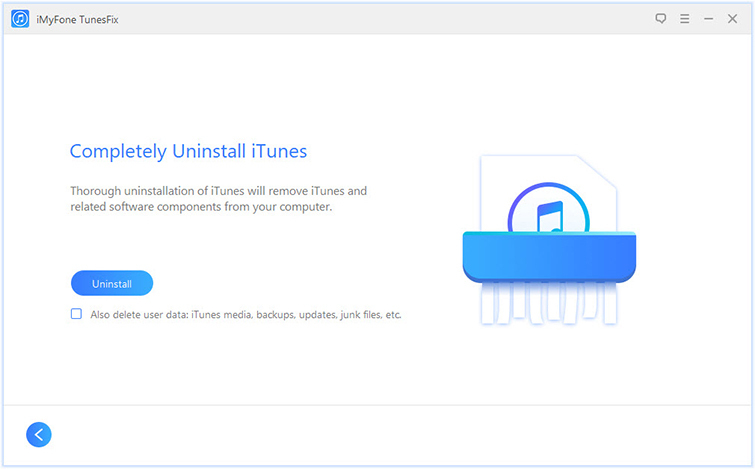 Step 2: Click “Uninstall” from the next page and it will start removing iTunes and its 5 components from PC. Note: If you want to delete iTunes data, check “Also delete user data…” before you click on “Uninstall”. Once the uninstall is done, tap “Click here” to reinstall iTunes. It has been tested by lots of authoritative and professional software review sites, like ioshacker.com, WindowsInstructed, megebyte, etc. It’s strongly recommended to be the must-have helper for iTunes. Besides, its real users also give it high rating score. TunesFix has already helped thousands of users to tune up their iTunes. So if your iTunes is not running in a good state, why not simply download the iMyFone TunesFix for a free trial. You would be surprise how powerful it would be.